For close to a decade, details about the multiplayer game that Blizzard called Project Titan have remained secret and elusive. Today we’d like to change that. In the wake of news that Blizzard has officially cancelled Titan, we can share a bit about what the project was meant to be: a massive multiplayer PC game in which players could both maintain non-combat professions and shoot their way through death-matches on a sci-fi version of Earth. This article was originally published on September 24, 2014. In honor of Blizzard launching Overwatch today, we’ve decided to bump it up. Blizzard declined to offer any details about the game when I reached out yesterday, but over the past 24 hours, I’ve talked to half a dozen people who saw or played the ambitious project, all of whom spoke anonymously because they were not authorized to talk publicly about what they knew. They’ve helped paint a broad picture of what was planned for Titan in the years before the game was drastically overhauled in 2013. It’s worth noting: game development is a fluid process, and from what I’ve heard about Titan, the developers were constantly changing and shifting plans over the months and years they worked on the game. Everything that follows is an amalgamation of information from ex-Blizzard employees, speaking to me individually, who tested, saw, or helped develop Titan between 2007 and 2012. So what was Titan? For starters, according to three people I spoke with, it would have taken place on a near-future version of Earth, in a science-fiction depiction of the world where mankind has successfully fought off an alien invasion. Players would join one of three factions waging a cold war over control of the planet, and zones planned for the game ranged from the west coast of the United States to Europe, South America, and Australia, according to a source. 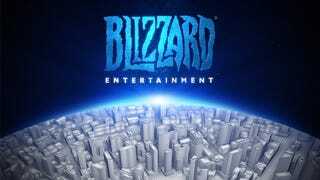 Blizzard’s plan was to make the game world huge, and to keep adding areas with expansions in the years after launch. The main concept was this: you, the player, would maintain a mundane job—butchering, engineering, entrepreneurship—during the day, while waging clandestine warfare against opposing factions at night (or between work hours). One potential scenario, described to me by a person who saw the game, might have gone something like this: You’re working for a corporation, helping run a shop, when you’re called for a mission by your faction, so you run into an elevator, switch outfits superhero-style, and go off to fight enemies with a group of friends or allies. Or you can just ignore the combat and keep doing your job, which could mean anything from tinkering with vehicles as a mechanic to running your own business as an entrepreneur. All of the people who described the game to me made a lot of Team Fortress comparisons both in terms of aesthetics and gameplay. Three people who saw the game have compared the aesthetics to Team Fortress 2, with one source describing it as a cross between StarCraft II’s in-game cinematics and Pixar’s The Incredibles. Your perspective would switch between first- and third-person based on whether you were heading into combat or hanging out in a city, according to two sources—not unlike Bungie’s Destiny. Sources described the game as an MMO split in two parts: the “real world” and the “shadow world.” (Similar in some ways to 2012's The Secret World.) In the real world, you’d craft, socialize, and work; in the shadow world, you’d shoot down enemies and fight through death-match missions with traditional shooter objectives like capture the flag. Blizzard’s goal was to make both courses fun, interesting, and viable, so players could pick for themselves which way they wanted to go through the game. Again, this was all part of Blizzard’s plan for the game. We may never know how much they accomplished, or what was changed and overhauled over the decade Titan was in development, especially in 2013, when the team was cut down and direction shifted entirely on the game once code-named Titan. But it’s still fun to dream about what could have been. One source described an early internal presentation of Titan that showed a professional cook saying he has to go, superhero-style, putting a dish in the oven, going out on a mission, and coming back to find that dish perfectly cooked and ready to serve. If you’re thinking this all sounds way too cool to be buried forever, here’s a bit of good news: One person connected to Blizzard told me that “a good handful” of the Titan team is actually still intact, despite yesterday’s news that the game has been cancelled. So maybe Blizzard’s still got a small team plugging away at Titan’s world and concepts in hopes of bringing something fun—and substantially smaller—out of the wreckage. But it doesn’t seem like we’ll ever see the Team Fortress 2-meets-Destiny-meets-The Sims-meets-World of Warcraft chimera that Blizzard was working on for so many years. Like Starcraft Ghost and Warcraft Adventures before it, the project once called Titan is no more. UPDATE (11/6/14): A month and a half after the publication of this article, Blizzard announced Overwatch, the multiplayer shooter that rose from the ashes of Titan in mid-2013.